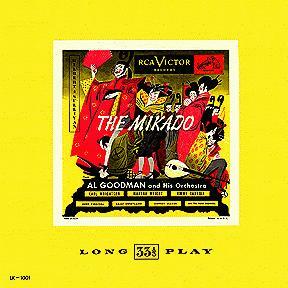 The general comments I made in reviewing the Al Goodman Pinafore apply also to this release of Mikado excerpts. The Mikado performance is marginally more effective than the Pinafore effort; the chorus is more decently prepared, and the voices are somewhat better. Jimmy Carroll, as Nanki-Poo, is more appealing (he succeeds in making Nank a sympathetic character), although vocally he still is second rate. Audrey Marsh is very good again, this time as Katisha, and she is joined by a Mikado (John Percival) who is her vocal match. Earl Wrightson is a strong bass-baritone essaying both Ko-Ko and Pooh-Bah. Martha Wright is more successful as Yum-Yum than she is with Josephine. Overall, the score is treated with more respect than the Goodman forces did with Pinafore. There's nothing quite so offensive as was the South Pacific-inspired "Over the bright blue sea," although the added brass fanfares in "Behold the Lord High Executioner" venture into a similarly banal territory. There are also startling, unneeded, and out-of-place moments for harp that come out of nowhere; they appear calculated to give the obviously low-budget production some "class." The occasional reharmonizations and revised orchestrations exude an aura of cheapness rather than modernization. The aggressive American accents and resulting change in musical inflections still are enough to drive one (certainly it did me) up the wall. It doesn't really make sense for RCA Victor to have made these recordings at all; they already had in print the early electric D'Oyly Carte versions, and technically these Al Goodman releases are not a significant improvement. Perhaps it was a deliberate marketing decision — they wanted to appeal to "American" tastes. The short catalogue life of the Al Goodman versions speaks for itself, especially because RCA Victor also made Lp reissues of the same D'OC operas only a year after they issued the Goodman excerpts. Other comments: the orchestra often sounds as if they had just read the music for the first time, playing competently but very carefully. About half of the musical numbers are transposed down — sometimes a half step, sometimes a whole step. This often appears to be an accommodation made for bass-baritone Earl Wrightson, but again also for Martha Wright, who apparently did not have a secure top G for "The Moon and I." "So please you, sir" is likewise transposed downwards, apparently for her (the second verse is cut, so it wasn't for Wrightson). These were New York (or, perhaps, Los Angeles) studio musicians, for heaven's sake! One would think RCA Victor could have done better. There is one interesting novelty on this record. The substitution for the "N" word in the Little List song is not D'Oyly Carte's "banjo serenader," but one I'd never heard before: "sobbing serenader." It's very 1950's, and probably more American in attitude than British. As I was listening to this on my lunch hour, a student nearby asked what it was. When I said "The Mikado," she said "Oh, it sounded like the Munchkins in The Wizard of Oz." She was referring to "Comes a train of little ladies," and, on reflection, I have to agree she had a point. The chorus sounded very much like that. 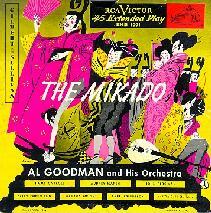 In the catalogue "Effective March, 1953," the 78rpm versions and the original (standard play) 45 versions of both Pinafore and Mikado had been deleted. This suggests that the 78 versions may be somewhat rare, as by 1950 that format was already well on the way out, and I wonder just how well the 45's sold, because the obvious reason for the "Extended Play" versions is convenience. For both items, the "Extended Play 45 rpm" versions are designated as "New Release[s]". The Mikado album is EKB-1001, and Pinafore is EKB-1002. The lp versions are listed also in the catalogue but are not designated as new releases. The old 45rpm numbers are no longer listed, so they must have been deleted in favor of the "Extended Play" format. The catalogue is unhelpful on this point, however, for in the alphabetical listing for all three items, the only reference in each instance is to the 33 1/3 lp. I am assuming that this footnote is in error, because there is another available footnote, which was used for Mikado (see below) which states, "not included in Extended Play album" — period. The Mikado entry has footnote signs for "Comes a train of little ladies" and "The criminal cried as he dropped him down." Footnoted for both albums are items which were not available in the "Extended Play" 45 rpm albums. Pinafore has footnote signs for "Sorry her lot," "Over the bright blue sea," and "Sir Joseph's barge is seen." The footnote here reads: "not included in Extended Play album but available as a 45 rpm single record." On the EP versions, the record grooves extend as far as they can to the center, so it is not difficult to understand why they cut some of the tracks.